This is my second post regarding Pelgrane Press and FIre Opal Media's 13th Age based on the first sit down session my RPG group, and I played together. The first session summary is here. So this blog post is more about the impressions and ideas I had while running my first d20 session in a very, very long time. Out of the gate, I have to say that the game ran really smoothly. I had one moment of being at a loss when I could not remember the target number for my Wyvern to try to disengage, but my players forgave me looking one thing up. Aside from that, it was really easy to run. It did help that I had done a lot of prep with cheat sheets, etc. for everyone ahead of time. We had previously spent a session creating characters and back story (you can read about it here), and between the time of that first session and the first session of play, I did try to do a lot of preparation. 13th Age does definitely lend itself to some very easy improvisational play, but I wanted to have some things at my fingertips and not have to have any pause or interruption of play while I looked things up. I had options which allowed me to flow seemlessly into different possible scenarios (so, for example, I had created a number of options for encounters, at a couple of different levels of difficulty, just so I would have them in my back pocket). I also prepared some goodies for myself and the players in the form of visual aids and manipulables. The game was starting out with the characters being given a mission based on their ties to the Priestess and the Elf Queen. I came up with a thumbnail of information for the representatives of each Icon and illustrated each NPC with some cool art from the web. I also prepared a batch of magic items in a format modeled on the sheet that is up at the 13th Age resources page that was made to go with their 2-hour demo. I found the format to be easy to adapt. Then I took it further! On top of just the flavor text and description of each item, I also added some art in the background (and learned a new skill with Microsoft Word 2010). I also added an Icon relationship for the items (which made sense for me, since I knew already what Icons were in play). On top of that, I cut out each little card and laminated the whole bunch (thanks to the foresight of my beautiful and talented wife owning a laminator). After reading about and listening to a number of actual play sessions with 13th Age, it was clear to me that a pretty common way to build ties between characters and their Icons, as well as to use positive Icon rolls was to award some magic item goodies to aid in quests and missions. So, I was ready with fun items which doubled as little props when we did Icon rolls. So, the first thing we did was to make Icon roles, and then I had to interpret them. We had some feast and famen issues. A couple people got a number of positive rolls, and others had none. Still, everyone was cool with it. Some characters got special items (and in some case complicating secret orders) in accordance with their rolls. Others will have to wait. There are still a number of unused Icon rolls waiting for the right moment later in the adventure. Also, I rolled an additional Icon influence as a wild card (I did this with a d12 and a Fudge d6 (+, blank, and -) and I subtracted or added from the d12 roll thus getting pontential range of 0 to 13. I decided 0 and 13 would both mean the Prince of Shadows, and otherwise assigned numbers to each of the other Icons. I have no idea how that may have skewed the math, but in any case, I rolled the High Druid. This gave me some pointers that I will be keeping in mind throughout the adventure. One of the first things it did for me was to help me decide on what "random" encounter on the way to the adventure we would have to test drive the combat system. Looking over my monsters, I decided the most primal and wild one that I had, that would potentailly be relatable to the High Druid was the Wyvern I had prepared. This was at the outer limit of the kind of monster a first level party could take on. On the other hand, there was only going to be one of them, and in fairly favorable terrain from the players point of view (since they could all attack with melee or missile weapons or spells without getting in each other's way). I held Mr. Wyvern aside for an opportune moment, and have also been thinking about other ways to show the interest of the High Druid in the outcome of the adventure. I should say again, I am running an old AD&D module from Dragon Magazine #78. It provided a sturdy framework for me to reskin it as a 13th Age adventure. So far it has been working very well because of how easy 13th Age is to put together monsters, traps and challenges that are both fun and challeging without going off the deep end on the player characters. In preparing to start off on their adventure, the player characters definitely capitalized on their backgrounds tro gather information. In fact, several characters just had outstanding moments in getting things to prepare for their trip and things that they might find. If they can critical that much in combat, they may make short work of the opposition in this adventure. Once they finally set forth, I moved things along until I brought out the Wyvern to attack. The sentries did an exceptionally good job in alerting to the Wyvern, so I did not get any kind of real benefit for the poor beast trying to glide in silently. The combat was fun and went well. It concluded in round 4, so we got to see the escalation die climb and add in effect, and most everyone got a moment to shine in the fight. I had a phenomenal evening as far as roilling monster initiative (I rolled a 20 for the Wyvern, and addint its bonus, it was at 28). I had a terrible night for doing anything else with my monsters. The Wyvern hit once, would have hit again, but got zaped with an illusion die from the Gnome Cleric, and once it was clear that the meal was fighting back too much, the Wyvern could not save to disengage, well, to save its life. Although it would have been fun to put a little more fear into the players, all in all, the test of how combat ran went very well, very smoothly, and I think we pretty much had everyone at the table thinking about what different options they had and what their powers and talents could do. Except the Bard. Granted, his player is about 10, and although he picked a super complex class with lots of powers, he didn't use any of them, and instead just hit the Wyvern with his sword (scoring at least one critical hit). I'll work with him next session to get him more used to the awesome stuff his character can do with songs, spells and war cries. For this session, he was having fun, and that worked. We had good roll playing moments and good tactical thoughts as the adventure unfolded, and I won't go blow by blow on that, since I already wrote up the session. One thing that I did in managing the "failing forward" was that we had a missed roll when trying to come up with some important information. There are a number of ways to handle this, but my "on the fly" was "I'll gladly give you this information now, in return for something bad cropping up later." Now, I did not make this explicit, and I think we are still finding our table play style. It would probably help buy in if I did make things more explicit, but we are still finding our way on that. As far as party actions, the great thing was that the group was totally able to avoid the linear appporach to problem solving, especially when they reached the "dungeon" site (a old ruined fortress with dungeons beneath). Yes, there was a passageway in and an Ogre guarding the front, but they managed to get a map to the layout and they scaled the wall at a different point. The only thing that tripped them up there was that I had the "bad thing" hit them as they were exploring the wall. I did not hose them completely arbitrarily, but I gave their scout, Zara the Rogue, some very hard saves to make, and she did not make all of them, thus alerting the occupant of the room whose roof them were going to go over, as to what was happening. On the whole, I am okay with the outcome because while it puts the party in danger, it also keeps the pace of the game and ramps up the tension and excitement without arbitrarily harming or killing any party members. We'll see how it plays out. So, now we are really going to have a run through with the combat system. While the party can only see one Orc right now, they are about to find out just how many monsters there are waiting for them. We closed the session just before the clash really got cooking because we were running up against our late limit because parents and kids gotta sleep. As far as after action, I had a chance to think about how I had structured the encounters in the fortress, pretty much following the pattern of the original AD&D module. Having played a first session allowed me to go back and fine tune things a bit to make things work in a way that I think will flow more smoothly and be more fun. We'll see when we play in a little over a week. The game, however, gives me a lot of confidence in how I am preparing things. I have also prepared a few more fun handouts and developed some more fun things for the dungeon levels below. I think one of the things I have leared with the flexibility of 13th Age is that keeping things static is neither necessary nor, often, desireable. Tell a good story, let everyone have fun, challenge the player characters, but play (as they say in Dungeon World, which has also been influencing me)) to find out what happens. Fine tuning along the way and on the fly feels very natural now. And having the tools like the Icons, Backgrounds and One Unique Things are really helping me fit the individual adventure events into a much larger, and I think much cooler, framework for the future. I am really loving the game, and I can't wait to see where it takes all of us in the future. We ran the first session of our 13th Age Campaign last Saturday with the characters we and back stories we created last month (note, the characters have been updated slightly since we made a few last minute adjustments in light of changes that happened since we created characters (e.g. this). We had a great session. We definitely were getting used to sitting together and making the system work. Some of us are long time role players, some have less experience, and we have kids from 10 to 15 sitting with adults. All together we have nine players and me as DM. So, given all that could go wrong, actually pretty much everything went right. I have at least two posts about this, the first will be the campaign narrative, although given the public nature of the posting, I will have to leave a few things vague. The adventure I am running is an AD&D module I am adapting from an old Dragon Magazine that I have, Issue #78. Before starting, we rolled Icon Relationship dice (for those not familiar with 13th Age, an Icon is a powerful mortal leader in the world who controls powerful secular, religious, spiritual or arcane forces (or a combination of all those); a result of a 5 on the d6 roll means a positive outcome with “complications”; a 6 is a clear positive outcome). Rolen rolled a 6 on his relationship with the Archmage and with the Elf Queen. Yoshi rolled a 5 on his relationship with the Emperor. Zara rolled a 6 on her relationship with the High Druid and with her relationship with the Priestess. Hey rolled a 6 on his negative relationship with the Orc Lord. Cerise rolled 5 on her relationship with the Priestess. Lief rolled a 6 on his relationship with the Priestess. I then rolled to determine other Icon influence and interest, resulting in the High Druid. We began the action in the Holy City of Santa Cora, in an Annex of the Cathedral. Eight of the nine characters, through their ties to the Priestess or the Elf Queen (or both) had been summoned to perform a service. Hey doesn’t like people to be left out, and so he brought Delthen, an Inquisitor of the Crusader, along without being invited. When you are a big well-meaning Half-Orc, people let you get away with stuff like that. Delthen tried to stay unobtrusive in the back in his commemorative First Triumph demon-skin coat and all black ensemble, embroidered with his badge of inquisitorial office, a crossed Mace and Severed Demon Claw across the Sigil of the Crusader. Yeah, he stuck out like a sore thumb. In the audience room, a representative of the Elf Queen and a representative of the Priestess met with them. The Elf Queen’s envoy was Valandil Nenharma (he might look like someone here), a High Elf cleric, one of the representatives of the Elven Pantheon in the Court of Stars. He is one of the key Diplomats from The Court at the Cathedral. Though a priest, he dresses more like an imperial ambassador. He does not care much for anyone who is not a High Elf, so his focus was mainly on Legolis, the ranger (who is a famed Strategist in past wars). The Priestess’ envoy was Abebi Tasartir, a Half-Elf Paladin from the Order of the Cathedral, the Shining Templars (and she might look something like this). Abebi was commanding but polite. She paid special attention to those tied closely to the Priestess, Cerise, Indigo, Zara and Lief. The party received a briefing on the old ruined costal fortress of Jawarl Avignon. Long ago it was an imperial fortress that helped keep the caravan route between Santa Cora and Axis, on the southern edge of the Midland Sea and along the Demon Coast, safe. However, as the Midland Sea was cleared of monsters and the Archmages perfected the control of the weather over the sea, the need for the caravan routes became less necessary. However, at the time, some five to six centuries ago, the Court of Stars had interests in the region, and the Emperor gave it to the Elf Queen of that era (not the current Elf Queen). About 500 years ago, however, an Orc uprising, led by a self-proclaimed descendent of the Orc Lord, Mondru the Fourth, took the area by storm. After ravaging the countryside and ending the little caravan traffic that had remained on the old trail, the Orcs turned their fury on the fortress, taking it by storm and killing every elf in the garrison. Mondru had a terrible artifact that aided him in his reign of terror, a spear forged as the bane of Elves. With Mondru and his terrible spear heading the charge, the Orcs seemed unstoppable. Abebi explained that what happened next was unclear, but it seemed that Mondru’s forces were suddenly devastated by a plague which ended their reign of terror. Valandil spoke up to say that “The Court of Stars knows what happened, but that is not a need to know fact here.” However, when asked respectfully by the Ranger, Strategist Legolis (who explained it was strategically relevant to their mission), Valandil reluctantly divulged what happened 500 years ago. The then Elf Queen demanded that an answer to the slaughter at Jawarl Avignon be devised. Each of the three branches of elvenkind at The Court retired to determine the course of action. The Dark Elves, however, determined simply to remedy the problem and provide the solution as a fait accompli. They performed a dark ritual (non-demonic, as Rolen was able to verify) which summoned the illness that devastated the Orcs (and, a good deal of the other human and demi-human population that had been left in the region) and ended Mondru’s rampage. It was known as the Green Death and it was usually fatal in 24 to 48 hours. It is unclear if there were any lasting effects intended from the ritual, and as the Dark Elves who created it have, in subsequent years, been exiled from The Court, it is hard to say if any plague lingers after 500 years. However, Valandil assured them it should be perfectly safe. This declaration was met with some skepticism. Nonetheless, the party listened to what the mission was to entail. The Priestess and the Elf Queen had both been concerned by the resurgence in power of the Orcs, especially given the siege of Concord a few years ago. Now they had been detecting an increase in Orc activity here to the south. Further, there were rumors that Mondru’s spear was still out there, waiting to be found. The Priestess dispatched a scholar, a monk (contemplative, not martial arts) named Crommard with an exploration team to test out his theory that the spear was still somewhere in the confines of Jawarl Avignon. After many optimistic reports, communication from the monk ended. Thus, the Priestess and the Elf Queen have decided to send a more robust expeditionary force to determine whether Jawarl Avignon is the resting place for the spear, and if it is, to retrieve it to be disposed of appropriately. The old fortress is closest to a town known as Awad, a small outpost that survives still with the trickle of traffic along the old caravan road. Yoshi and several others of the party have been to the miserable little place before. It is not much, but it is where Crommard went to stage the exploration of the old fortress. According to the information that Abebi had from the records of Monk Crommard’s expedition, he took with him another scholar “Seth,” and a gang of workers with several foremen, an apprentice, and several watchmen, all told about two dozen people. Their fate is unknown. The party accepted the mission and left to begin preparations to leave the next day. The Priestess and Elf Queen's representatives gifted the party with consumable magic items to aid them, including a small collection of Runes, some magic oils and a good number of healing potions. Abebi asked Cerise, Zara and Lief to stay after the briefing for individual discussions. She spoke to each of them individually. 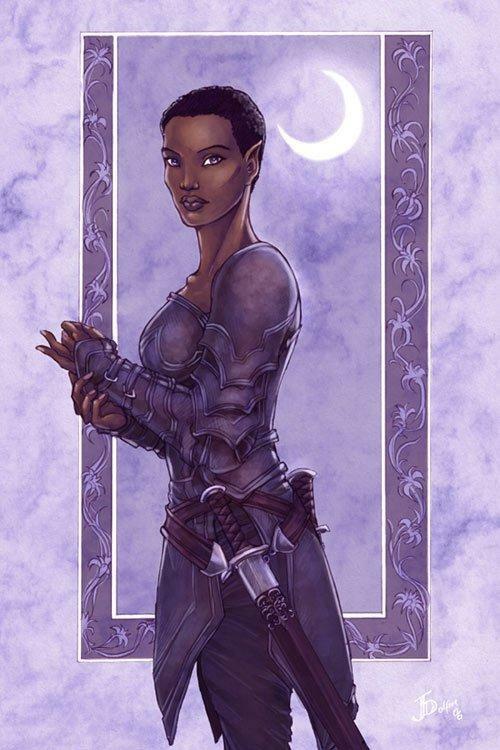 To Cerise she presented a gift of magic armor, bequeathed by the Priestess to aid in the mission. Abebi also gave her secret orders. Zara had a private discussion about her future association with the Priestess, and received a magic ring to aid her in the mission. Abebi conveyed to Lief the praise and thanks of the Priestess for his many devotional performances of song and music. He was presented with a protective hood to aid in the success of the mission. When Rolen returned to the magic quarter, he was summoned to the Archmage’s Chantry where he met with a representative of the Archmage. Though the old wizard who met with Rolen could hardly stand to be in the same room as a mere sorcerer, he conveyed to Rolen that the Archmage’s organization was pleased with him and wished him success in the mission for the Elf Queen and the Priestess. To this end, the Archmage had sent him a magic wand to aid him. As Yoshi left the Cathedral, a messenger handed him an order commanding him to appear at the Governor’s Palace. There he met with an Imperial Official who presented him with a magic sash to aid in the mission. He was also given secret orders on behalf of the Empire. Zara decided she needed more information about the area where they were going. The town of Awad is many days journey from Santa Cora, and lies along the Coast, a few days journey from the ruins of the Golden Citadel. She, accompanied by Yoshi, tried asking around at the map sellers of Santa Cora for a detailed map of the area where they were going, but all denied having anything. She was suspicious, however, and went to the stall with the best reputation, while the seller was down the street at a noodle stand and snuck in the back. Yoshi kept watch and made small talk on the street. Zara scored particularly well on her thievery roll, and came up with a detailed map (I dutifully photocopied the relevant portions of my map and handed it over). Lief too decided to use his contacts in Santa Cora to try to come up with information and background to help them with their mission. He spoke with an old monk, Chai Lin Choy, who turned out to be a rival of Monk Crommard. Monk Chai gleefully related to Lief the information that Crommard could have learned from him if he only had swallowed his pride to ask. He related the contents of an old imperial report (A Warning ) which, during the last Age, sounded the alarm that a creature known as a Man-orc had come into existence under the power of the Orc Lord, after he was excluded from the spoils of the fallen Wizard Kingdom. Monk Chai also related that there were legends tying the Elf killing spear to the rising up of the Man-orcs as well as the return of the Orc Lord. When Lief reported the information from Monk Chai, the rest of the party immediately focused on the possibility that Crommard, Seth or both could be Man-orcs. The party gathered their pack animals, riding horses, camels, and whatnot, and set out down the old caravan trail. Very little notable happened until the night of their seventh day. Delthen and Zara were on watch at the oasis, Pashtadiin, where they were camped. Lief was awake by the fire, despite having already stood his watch, but working on some songs and poetry. Everyone else was asleep. Posting watch had not been in vain. Both Zara and Delthen detected suddenly a huge creature swooping in to land near their sleeping friends. They raised the alarm and moved to attack. The Wyvern which swooped down got detected far enough away that, while it handily won initiative, it had to use both its move and standard action to get in close enough for a meal. Delthen charged forward on his turn to bash the Wyvern with his mace for a solid hit. Lief loosed an arrow, but missed. Zara threw one of her blades, but merely nicked the beast (miss damage). Everyone else woke up and rolled initiative (except Hey, who was really soundly asleep). Yoshi and the Wyvern were tied for initiative (at 27). Yoshi hit the Wyvern, the Wyvern hit Yoshi. The Wyvern’s roll also qualified it to make a poison sting attack next round. Neither monster nor samurai went down, but Yoshi was in pretty bad condition. The two clerics both hit Yoshi with healing spells on their turns. Delthen continued to bash with his mace. Indigo, besides healing Yoshi, also used his Trickery/Illusion Domain to create a trick die of a very bad roll to use for later. Rolen fired Scorching Ray. Lief, the Bard, simply ran forward with his sword and rolled a critical hit. Zara continued to miss her throws, but do miss damage. Legolis cast his Acid Arrow, but only did miss damage. The Wyvern took acid damage from the ongoing from Acid Arrow. Yoshi missed, but the Wyvern fumbled with its main attack. When it rolled to hit Delthen, Indigo substituted his “trick” die for the roll, and the poison sting missed. The Wyvern failed its save against the acid. Delthen missed with his Smite Evil, but did miss damage. Indigo failed to distract it with an illusion. Cerise cast her Javelin of Faith. Rolen stuck with his reliable Scorching Ray. Lief eschewed any Bardic powers and just hit the thing with his sword again. Legolis hit with an arrow. Zara missed with her crossbow (one more point of miss damage). Hey woke up and grabbed his club. He rolled a terrible initiative (4). Yoshi missed and the Wyvern failed to disengage and then missed its attack on Yoshi. Cerise missed with her Javelin of Faith, but did the miss damage. Delthen rolled a critical hit and smashed the Wyvern to the ground where it expired after having been shot, cut, smashed, slashed and burned with fire and acid. Delthen made much of the fact that he landed the first blow against the Wyvern and also struck the blow that slew the beast! Hey Watchit gave everyone croissants. Since the Wyvern attack was a test drive for the DM as well as the players, I let everyone have the benefits of a “full rest” so they were able to try things out on the poor dragon-wanna be without jeopardizing their ability to complete their ability to bring powers to bear in the main adventure. The party had several more days of travel. On the day they were to arrive in Awad, but miles out from the town, they started to encounter a steady stream of refugees fleeing the town. The fearful people declared that the legendary Green Death had returned because of the meddling of the foolish old monk and his workers. The people of Awad warned them to stay away from the haunted fortress, but they kept meddling until they unleashed doom on everyone. Several in the crowd noticed that Rolen and Legolis were elves and begged them to take off the Elvish Curse and to allow them to return to their homes. Neither were able to give a satisfactory answer to the crowd, and they got pelted with garbage and other refuse by the unhappy and desperate crowd. Lief tried to calm things down and to listen and record people’s stories. He helped diffuse any chance of a riot. In the meantime, Zara slipped into the crowd moving down the road and tried to question people about the details of what had happened. After several times being rebuffed and facing increasingly steep odds of getting anyone to talk to her, she found the proprietress of Awad’s main tavern walking with a cart, animals and her children (and Zara scored a critical in her social roll). Since Zara grew up in a tavern herself, she established an immediate rapport with Jin the Tavern Keeper. Jin told Zara that Crommard had come into town that day to get some supplies. Suddenly, people came to the center of town proclaiming that Crommard’s companion, Seth, had approached the edge of town, staggering and covered in green patches of skin. He declared to the people that the Green Death had returned and killed everyone at the fortress of Jawarl Avignon. He was the last survivor, and he was fleeing into the forest to die after warning the town to flee for their lives. This caused a panic as people grabbed what they could and headed out of town. Some few people stayed behind threatening to cobble together a scaffold and punish Crommard for bringing down the Elvish Curse on Awad. Jin thought the mayor, the constable and several of the young men had stayed arguing over what to do with Crommard. Zara thanked Jin and told her what her best prospects were should she travel all the way to the Santa Cora area. She then returned and rejoined the party to relate what she had discovered. The party then split, with about half (Yoshi, Delthen, Hey and Lief) heading into town, and the other half (Cerise, Zara, Indigo (and especially the two elves) Legolis and Rolen) heading to the area where Jin had related Seth had made his last appearance. In town Lief calmed the crowd and the party negotiated Crommard’s release and started questioning him. He was very confused. He was distressed to hear of the possible death of his fellows, and he was worried about the state of his work. Out of town, Zara and Legolis had difficulty finding the tracks, but finally determined that after Seth staggered into the woods, he started running back to Jawarl Avignon. [They “failed forward” by gathering a little bad karma that would come back to bite the party]. The party reunited at the crossroads where the road to Jawarl Avignon split off from the caravan trail. Crommard explained that besides Seth, his crew had consisted of 16 workers, 4 watchmen, 2 foremen and an apprentice. He feared for all their lives. He told them that they had made an important discovery just in the last week. He believed they had uncovered the area where they would find a secret door which would admit them to the subterranean part of the fortress. He had been grumpy when Seth informed him that they needed some new supplies before proceeding to locate the door. They brought him along as they approached the ruined fortress. Suddenly, it occurred to Cerise to ask if Crommard could draw them a map of the parts of the fortress that remained standing. He immediately obliged, particularly extoling the “hall of death” which defended the entrance, where a few men could hold off an army raining arrows down on them as they tried to get into the still standing inner courtyard of the fortress. As the party crept up, their scouts noted that a rather large Ogre had now taken up a post in front of the passageway that led into the fortress. They pulled back and moved up to the walls around the corner from the entrance. The walls were up to 20 feet high, but the tops were crumbled, and any structure which had allowed patrols to walk atop them were long gone. However, the roofs of the interior buildings still existed for many of the inner rooms, though they were in poor shape. Zara went up the wall and surveyed the courtyard. The sun was rising, and no living thing was out in the courtyard. However, there was a pile of dead bodies, some hacked up, by the old abandoned well. Making a critical perception check, Zara determined that somehow, an Owlbear had taken up residence at the bottom of the dry well/cistern. Someone may have been slowly feeding parts of the dead workers to the Owlbear. She spotted the area of the fortress across the courtyard where the door to the lower level was supposed to be. She came back down and explained what she had seen. There was an extensive discussion and voting as to whether to try to make their way around the fortress and go over the wall and try to take the area with the secret door by storm, or whether they should try to lure off the Ogre, dispatch him, and try to make it in the front way. Eventually, they decided to make their way around the fortress, with Zara moving along the top of the wall to keep an eye on things. Unfortunately, the walls were very challenging to navigate, and just besides a roof covering a seemingly disused room, bad karma came along and required some tough rolls to avoid a partial collapse of the roof. Zara came close, but did not succeed, and an Orc Sergeant spotted her silhouetted against the sky through the new hole in the roof of the room he was in. Everyone rolled initiative. The Orc rolled a phenomenal 28. He took out and blew a warhorn. The party sprang into action. Lief climbed up the wall, Indigo failed to distract the Orc with an illusion. Cerise blessed Zara, Yoshi and Legolis. Delthen had trouble getting up the wall. Legolis teleported to the top of the wall and took a shot, but missed (doing miss damage). He also borrowed Rolen’s Elven Grace with his pet snake’s “mimic” ability, but failed his first roll with it. Yoshi made it partway up the wall, as did Rolen. Zara missed the Orc with her crossbow (doing miss damage). Hey then rolled a 20 and used it to propel Yoshi and Rolen to the top of the wall creatively using his “reach trick” feat and his magic tree club. Monk Crommard cowered and muttered something about being an academic, not a warrior. The Orc turned and ran out into the courtyard, apparently running to get help. And that is where we left it. The party is storming over the walls into Jawarl Avignon. They can see but a sole fleeing Orc. What else awaits them remains to be seen.